Well, I did it! I made my first pair of shoes. Are they perfect? No! But do they kinda look like shoes? Hell yes! I have a lot to learn, but for my first pair I just went with my basic sewist instinct. How would a sewer make shoes? For me it was a logical place to start, and I learned a lot along the way. Admittedly, sewing is very different from making shoes. There's different skills, different materials, and a lot more glueing. A lot. But, sewing does give you certain advantages in learning the craft. I know how to make a curved seam lie flat, I have oodles of fabric for muslins, and I own a sewing machine or three. So this post is all about how I made my first pair. How a sewer would. It's not necessarily the traditional way, although it does incorporate things I've learned from shoe makers online. Rather, it's how I used my sewing materials at home to craft my first pair of shoes. They're far from perfect, but I'm very excited about my first attempt. If you've ever traced or drafted anything yourself, drafting shoes is no different. I traced my own using my deconstructed shoe (full post here) and several muslins. However, if you'd like a boost there are several patterns available online. Shoeology and uku2 sell beginner patterns on Etsy with lots of instructions and hand-holding. 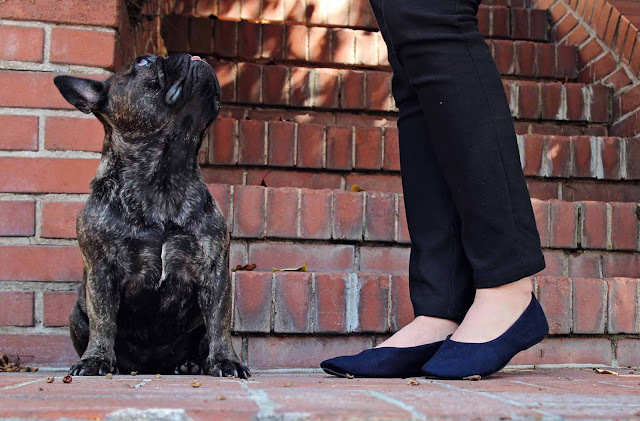 I also like their modern shoe designs, which aren't too cutesy and aren't slippers. I have noticed though that non-garment patterns don't always follow the same conventions that we are used to. I've found dog clothes patterns and shoe patterns sometimes have odd seam allowances and less attention to sewing details, so watch out. Interfacing: Again this is something most home-sewers will have on hand. I used a moderate fusible interfacing for the body of the shoe, although I may experiment with heavier options on later shoes. For the toe and heel puffs, I used Pellon fusible thermo plus, which gives some nice fluffy padding and shape to the shoe and heel. Insole: My deconstructed shoe had a padded insole. There are insoling options available on Etsy, but for my first version I just used bra cup foam I had on hand. Familiar, and no trip to the store needed. You can choose to either glue your fashion fabric to the top of the insole so it matches, or leave as is like I did. Soling: You will most likely have to purchase soling. I used Sole Tech which I found on Etsy from Two of a Kind Supplies. They were a really good resource for shoe-making supplies and have many different thicknesses and options, from indoor non-slip to thick outdoor soling. Next time I will try something thicker, maybe 1/4" thick rather than 1/16. Glue: This also required a purchase, although some of you may have some in your garage. I bought Weldwood Contact Cement. Other contact cements like Barge, Klebfest (UK), or even the non-toxic Aquilum should also work for attaching the shoe to the rubber sole. You put the glue on both surfaces, wait for them to become tacky, and press together. Less glue is preferable, as it doesn't take as long to dry. I also had some Speed Sewn fabric glue on hand, which is useful for attaching lining to the insole, etc. Lasts: Do you need lasts? If you're going to really get into it, I believe you do need shoe lasts. 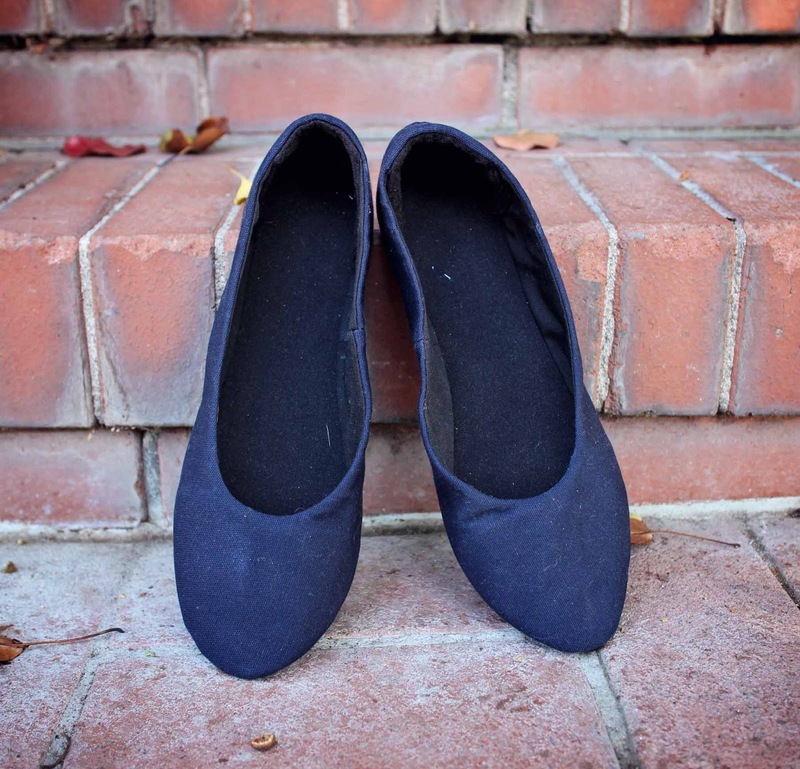 However, the sewing patterns listed above can help you make shoes without lasts. I used a shoe tree we had in the closet, which was free for me and was fine for my first pair. 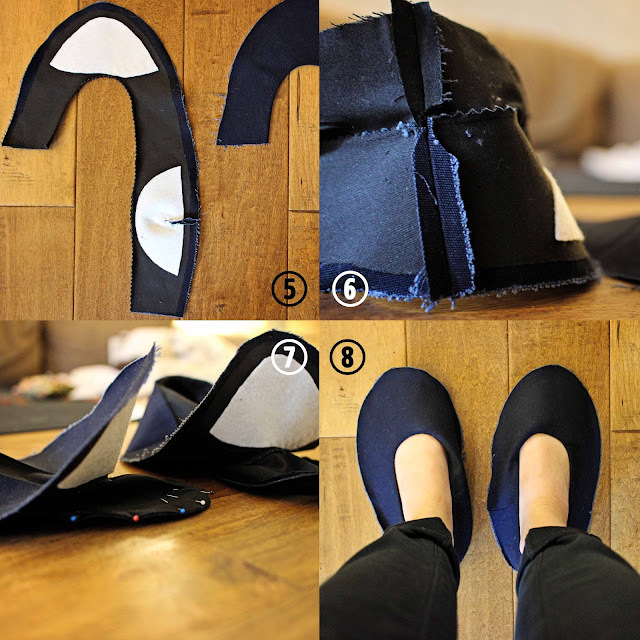 DIY Shoes: Great step-by-step from materials to final shoe. At this point, if I were planning on covering my padded insole with a lining fabric, I would have also glued the insole lining on top of the insole and set aside to dry. 2. Apply interfacing to the wrong side of the shoe outer. Fuse or glue toe puff and heel stiffener in place on top of interfacing. All these layers felt thick, but in the end they could have been even stiffer. 3. If desired, sew additional felt stiffener on top of the lining. 4. 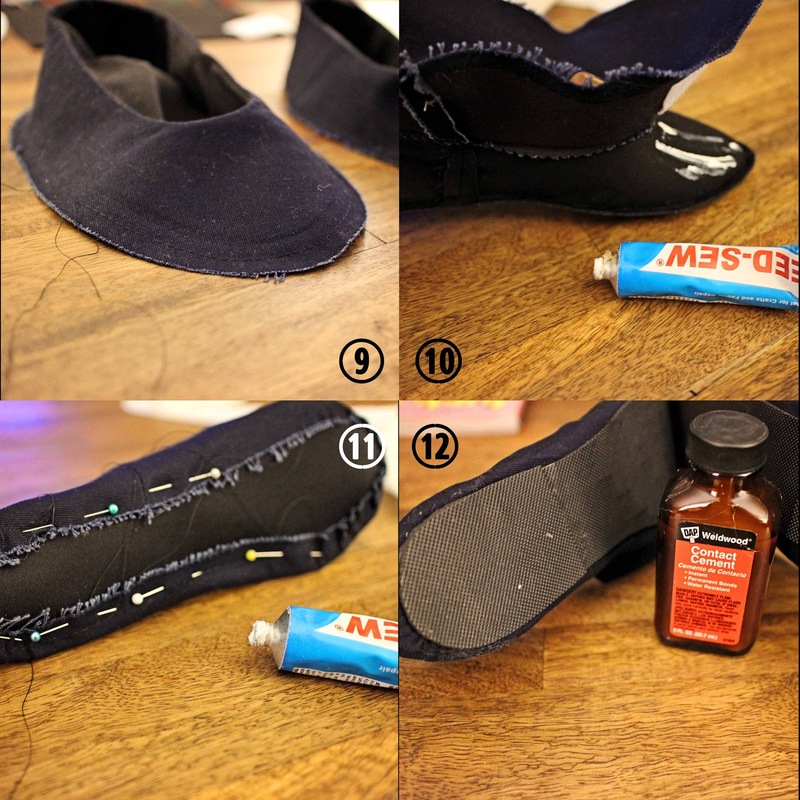 If your pattern has them, sew the heel darts in outer and lining. Clip seam allowance of dart. 5. Sew lining to outer along top edge. My pattern was drafted with 3/8 seam allowance for everything. Trim and notch seams carefully - pinking shears work great for this step. Turn to right side. 6. Open up lining and outer and sew side seam together in one continuous seam (lining and outer). Notch seams. Optionally, understitch or topstitch around opening, depending on style and preference. 7. Sew lining to insole, right sides together (seam facing outside of shoe). Leave outer free. 8. Try shoe on for fit, even though only the lining is sewn in. Then trim seam allowance around insole to 1/8". 9. Sew gathering stitches at toe and heel, about 3/8" from edge. 10. Put last in shoe. Apply light coat of fabric glue between lining and outer and press together. 11. Pull gathering stitches to warp outer around bottom of insole. Glue outer to bottom of insole. I used pins through the fabric and insole in this step to hold everything in place while the glue dried. 12. Glue on the sole and heel to the insole, covering fabric. I think you are also supposed to sand the heel flush with the sole at this point. Truth be told, my first pair went much better than expected. They fit, although they could be a bit more snug. 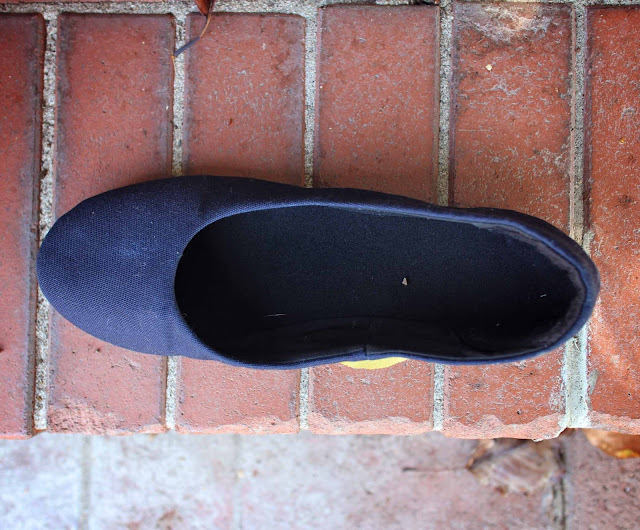 All the components are there, and they feel a bit more shoe-like than regular slippers. However, I know I have a ton to learn. At this point, they still don't feel like "real" shoes. I need to get a thicker soling and glue it better to the bottom of the shoe (in the photos you can see the soling isn't glued on tight). I also want to use a sturdier material. Yet at the same time, all the layers make these shoes really hot! I also need to tweak the pattern a bit. The toe puff isn't positioned right - you can see some wrinkling where it ends in the wrong place. And the toe isn't quite on center, so that needs to be fixed. There is also some gaping that remains, but that might be fixed by using a stiffer material. To start me off, are there any shoemakers out there with tips for next steps? Anything in the above that I could absolutely improve on that I haven't mentioned? 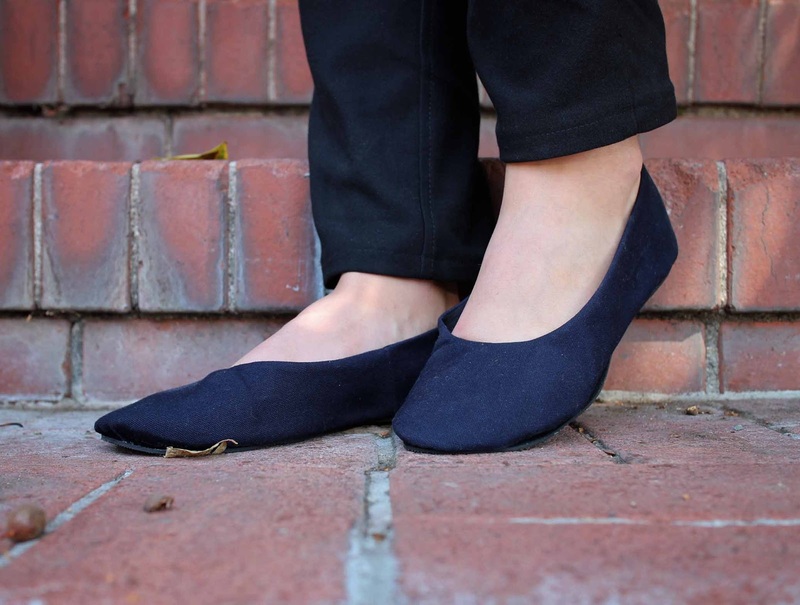 I have plans to get the I Can Make Shoes Flat Pumps Ebook (which is surprisingly affordable), and go from there. Woohoo! No better feeling, I know it well! The easiest way to stop gaping on the top line is taking about 2mm off the back seam, there's a clever way to adjust from your flat pattern as well but so hard to describe in words. I know what you mean about wanting a bit more strength to them. I remember cutting out buckram from the same pattern piece as the shoe and sewing it as just another layer in there. It helped but sturdiness in shoes and materials you use can be a personal thing. Don't stop experimenting, it's such a fun ride! Oh brilliant! I can't wait to be able to make and wear a pair of me-made shoes! 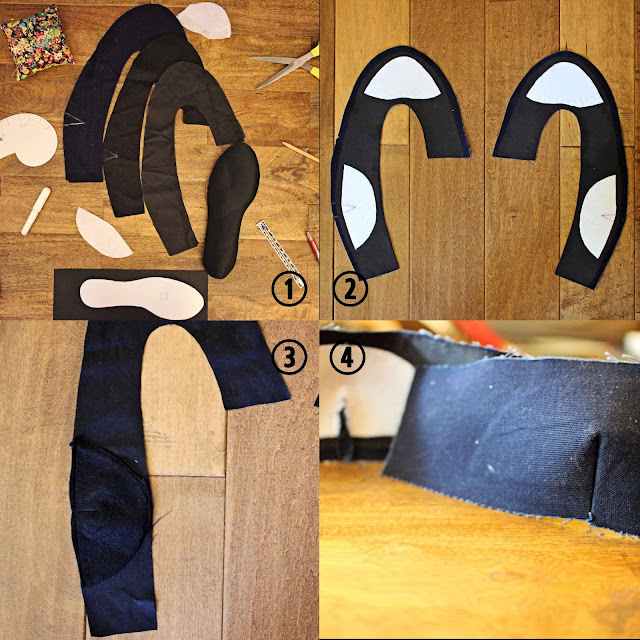 Check out UK based company 'icanmakeshoes' for free shoe templates, pattern making tutorials and even ebooks on making ballerinas from start to finish! Well it helps to have multiple endorsements! If you end up using their techniques in your shoe-making, let me know how it goes. Wow! This is so impressive and your finished shoes, well, look like shoes! Amazing work! Oh- nervous nelly here! Be super super careful when you use glue like that... if you're going to use it with any frequency it's probably a good idea to buy a painter's respirator (we use Barge all the time in puppet builds so I'm really cautious about exposure to it).